The Palestinian Hamas movement has criticised the appointment of former UK Prime Minister Tony Blair as an international Middle East peace envoy. The Islamist militants, now in control of Gaza, said Mr Blair had not been honest or helpful while prime minister. But the move has been welcomed by Israel and the Palestinian Authority. Mr Blair's mandate includes mobilising international assistance to the Palestinians and helping to develop their institutions and economy. Mr Blair, whose appointment was announced hours after he formally resigned as prime minister, said a solution to the Middle East's problems was possible but required "huge intensity and work". During his final prime minister's questions in parliament on Wednesday, Mr Blair told lawmakers that his "absolute priority" would be to bring about a two-state solution to the Israel-Palestinian conflict. 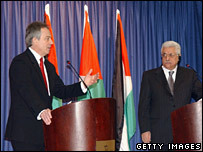 But Hamas spokesman Ghazi Hamad said Mr Blair had not created a good impression with the group. "According to our experience at the time he was the prime minister of Britain... he was not honest and was not helpful in solving the conflict in the Middle East," Mr Hamad said. He added that Mr Blair had constantly adopted "the American and the Israeli position". But Palestinian Authority President Mahmoud Abbas said the newly-appointed envoy had given him "the assurance that he will work to arrive at a peaceful solution on the basis of two states". Israel, too, welcomed Mr Blair's pledge to focus on the conflict. Israeli Prime Minister Ehud Olmert "believes that Mr Blair can have a favourable impact", Mr Olmert's spokeswoman, Miri Eisin, said. The White House also hailed Mr Blair's appointment, but played down expectations. "He's not superman, doesn't have a cape," said White House spokesman Tony Snow. "He's not designed to be doing that. What he is designed to do is to work as an aggressive facilitator between the Quartet and interested parties to try to look for ways to make progress where in the past we have not seen the kind of progress we'd like." Mr Blair's appointment was delayed because of Russian reservations. Observers point out that Mr Blair's mission, as defined by the "Quartet" of international mediators which appointed him - Russia, the US, EU and UN - is narrow. His brief includes Palestinian governance, economics and security, rather than the wider conflict between Israel and Palestinians - at least initially. Mr Blair replaces the Quartet's previous envoy, former World Bank President James Wolfensohn, who resigned last year in frustration at the lack of progress. BBC Middle East editor Jeremy Bowen says Mr Blair will have a tough task ahead of him.